This guest post comes courtesy of Andrew Josey, Director of Standards within The Open Group. Last Wednesday represented a significant milestone for The Open Group’s TOGAF 9 certification program. In case you hadn’t already seen it on our homepage, Twitter, or LinkedIn, the number of TOGAF 9 certified individuals has now surpassed the 25,000 mark, an increase of nearly 8,500 new certifications in the equivalent 12-month period! For those of you who might be unfamiliar with the name, TOGAF, an Open Group Standard, is a proven enterprise architecture methodology and framework used by the world’s leading organizations to improve business efficiency. However, Wednesday’s milestone isn’t the only positive reflection of TOGAF adoption in recent times. Just weeks ago, the latest Foote report placed TOGAF skills and Open CA certification (an Open Group Certification) top of the 340 highest paying non-certified and 289 highest paying certified IT skills, respectively. There is no doubt that the success of both can be partially attributed to a huge surge in the popularity of open standards over the last few years -- including TOGAF and Open CA. The economic downturn has its role to play here, of course. Since the financial crisis began, open standards have helped by providing a framework that allows Enterprise Architects to save their companies money, maintain and increase profitability and drive business efficiencies. 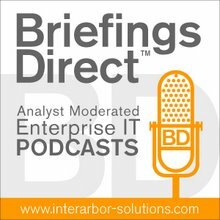 And, on a professional level, certification has helped Enterprise Architects to differentiate themselves, delivering better job security and employment prospects through testing times. 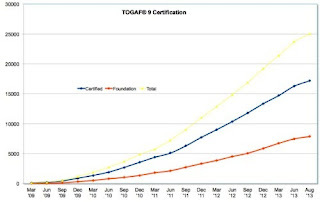 As you can see from the graph, there are two levels defined for TOGAF 9 “people certification,” and these are known as TOGAF 9 Foundation and TOGAF 9 Certified, respectively. To provide you with a brief background on these, certification to TOGAF 9 Foundation demonstrates that the candidate has gained knowledge of the terminology, structure, and basic concepts of TOGAF 9, and also understands the core principles of enterprise architecture and the TOGAF standard. Certification to TOGAF 9 Certified provides validation that in addition to the knowledge and comprehension of TOGAF 9 Foundation, the candidate is able to analyze and apply this knowledge. However, while there are now 50 TOGAF 9 training partners across the globe and 58 accredited TOGAF 9 courses to choose from, more and more of these certifications are self taught. At the last count we had sold more than 7,700 electronic self study packs for TOGAF 9 certification, making it the number one best-seller in our electronic commerce store. These have proved particularly popular in smaller global markets where face-to-face training courses may be less accessible or costly. Of course, as we celebrate a great milestone in its evolution, credit must go out to the many people who have helped develop and continue to help develop the TOGAF standard, in particular the members of The Open Group Architecture Forum. Today’s milestone is not only a testament to the value placed in trusted, globally accepted standards supported through certification, but to their endeavors. It was not so long ago we announced on this very blog that TOGAF had become a globally recognized, registered brand trademark. Now, just a few months later, we celebrate another significant milestone in the evolution of TOGAF. Long may this evolution (and the milestones) continue!